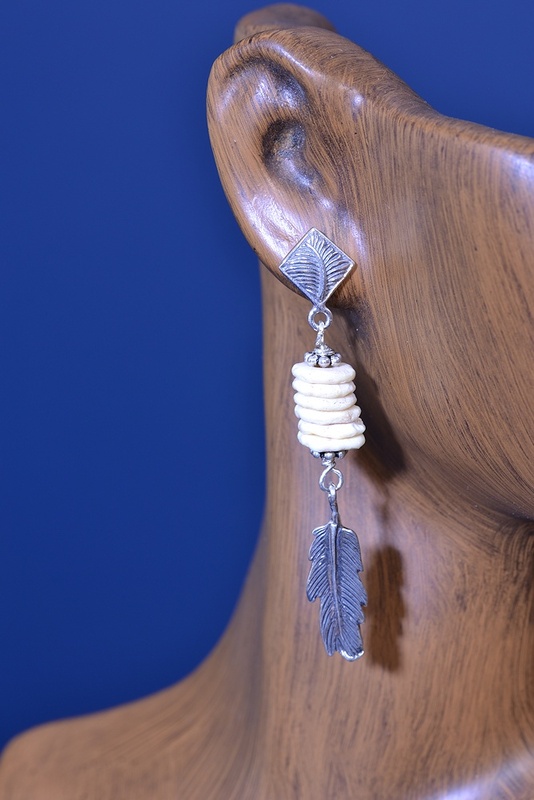 How odd: a carved bone feather surrounded by diamonds?! I rarely use diamonds, whatever possessed me to buy this feather? Perhaps, like the crow, I couldn't resist the sparkle! Obviously (isn't it annoying when people say, "obviously?" 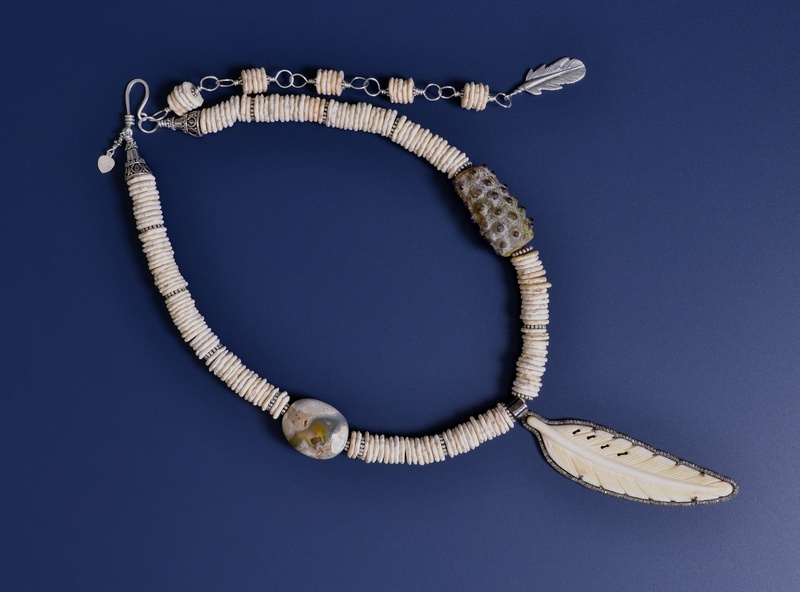 Forgive me, I mean it to be amusing, as it "it was obvious to me but you can call me a nutcase") obviously the feather demanded ostrich eggshell beads, a thunder egg and a handmade glass bead. Ahsian points out that diamond stimulates and opens all of the chakras, especially the crown and etheric chakras. She points to the transformation diamond undergoes under tremendous pressure and heat from black carbon to radiant clear crystal, the hardest natural substance known, as a model for us in these turbulent times. Hall chimes in with the observation that a diamond's beauty is only revealed slowly as it is cut, faceted and polished, seeing this as a metaphor for polishing the soul "until the refracted light of the inner being creates its own cosmic fire." Melody mentions that thundereggs can provide a link with the "star people" a thought that is reflected in the tiny star-like lights surrounding the feather. Kunz has so many stories about diamond it's hard to know where to start. (I hope the nibbles I offer will encourage you to get the books I mention!) He quotes Exodus (KJV) which says diamond is the third stone in the second row of Aaron's breastplate (associated with the tribe of Naphtali) but arguments have arisen about this. Some texts translate yahalom as moonstone rather than diamond. Kunz also reports the story of a noblewoman of the house of Luxemburg, who had two diamonds which "engendered progeny like themselves" by first changing the surrounding air into water and then condensing and hardening this into diamonds. He also discusses Aristotle's claim that Alexander was the only one to ever reach the source of diamonds (never mind that the book in which this claim is made was an Arabic text probably from the ninth century). They occur, according to the text, in a valley so deep "the glance cannot penetrate to its greatest depths." Unfortunately the valley was full of snakes so fearsome that they killed everyone who looked upon them. Alexander brought a mirror to the snakes which they looked into and died. A wise man told him to throw flesh down into the valley and vultures seized the flesh along with the diamonds which stuck to it, so and his men only needed to chase down the birds and collect the stones. 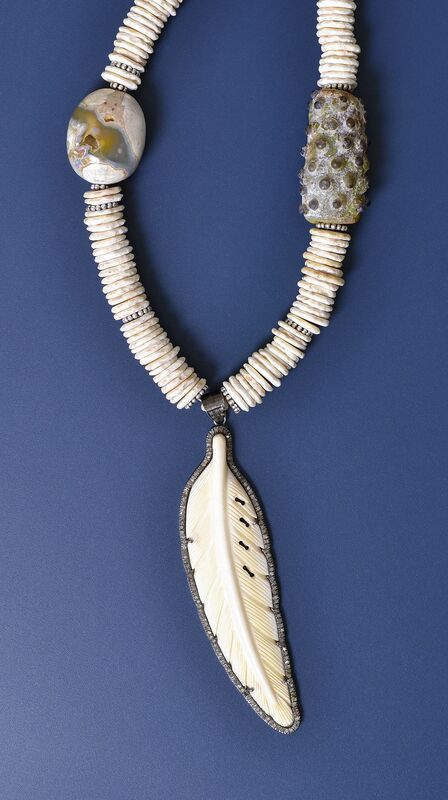 How I wish I could have found that ostriches had brought up the diamonds from the abyss instead of vultures, thus giving me a reason for including their eggshells in this necklace! Alas. I could resort to observing that ostriches and diamonds both occur in South Africa, a rather boring correspondence. BUT, all is not lost in finding an interesting relation between diamonds and ostriches! You see, the famous House of Boucheron made a "youthful" diamond ostrich feather tiara for the original Mrs. Astor who (scandalously) ordered it when she was 68 years old. It may have passed to her son's wife Madeleine. Madeleine and John Jacob Astor IV were aboard the Titanic, he helped Madeleine board a lifeboat but as a man, he was not allowed onto the lifeboat and did not survive. The Meylan book (below) speculates that the diamond ostrich feather tiara may now lie at the bottom of the sea. 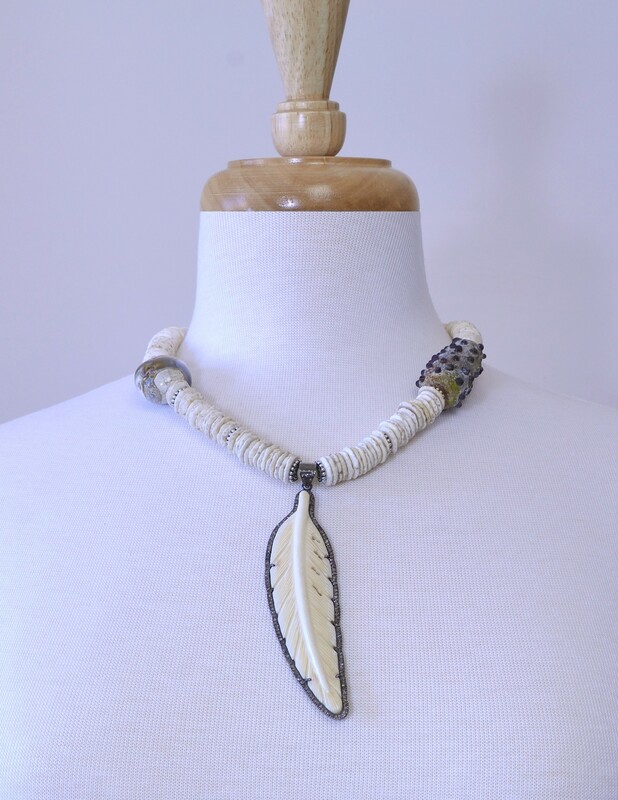 The composition of this necklace is unusual, neutral enough to be worn with anything, and sparkly enough to be worn for cocktails! Won't you order it today and enjoy its subtle contrasts? Please note: The tag attached to the feather indicates it has 1.15ct of diamonds and 34.75ct of bone (I've never seen bone measured in carats before!). I am not able to verify this information. It is beautifully made and the vendor was at a reputable gem so I must represent it as his documentation showed without further warranty. Unfortunately my photos don't capture how bright the tiny stones surrounding the bone carving are. Their champagne color is subtle and does not overwhelm the bone. You will marvel over all of the tiny hand-set stones in this piece!